Sometimes before a storm arrives, or even out of the blue, a rare 'roll cloud' commands attention as it floats ominously overhead. September 1, 2016, 12:20 p.m.
Thunderstorms produce a lot of weird phenomena, many of which are easy to miss amid the urgency of lightning strikes, tornadoes or flash floods. But before a storm arrives, and sometimes just out of the blue, rare atmospheric quirks known as "roll clouds" command attention as they float ominously overhead. "It was amazing," photographer Rob Sharrock told the Daily Mail in 2010, after spotting a roll cloud over Warrnambool, Australia. "I just looked up in the sky and said, 'Bloody hell, what on Earth is that?' It seemed to go on for miles." To unravel some of the mystery behind these stormy spindles, scroll through the collection of rockin' roll cloud photos and videos below. 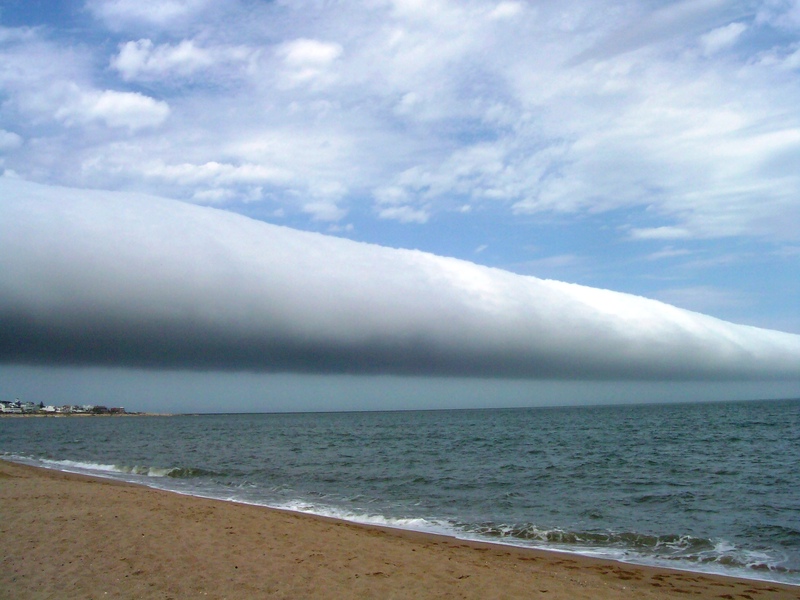 The eerie scene above, captured in January 2009 at Las Olas beach in southern Uruguay, hints at how far roll clouds can stretch out. It also reveals another quirk: They tend to work alone, often snaking through the sky without a storm in sight. Roll clouds are a type of "arcus cloud," formed when updrafts and downdrafts churn the front edge of a thunderstorm (or cold front) into a sideways cylinder. But unlike shelf clouds, the other arcus variety, roll clouds are detached from their parent storms — sort of like if a car's front axle broke off and rolled away. 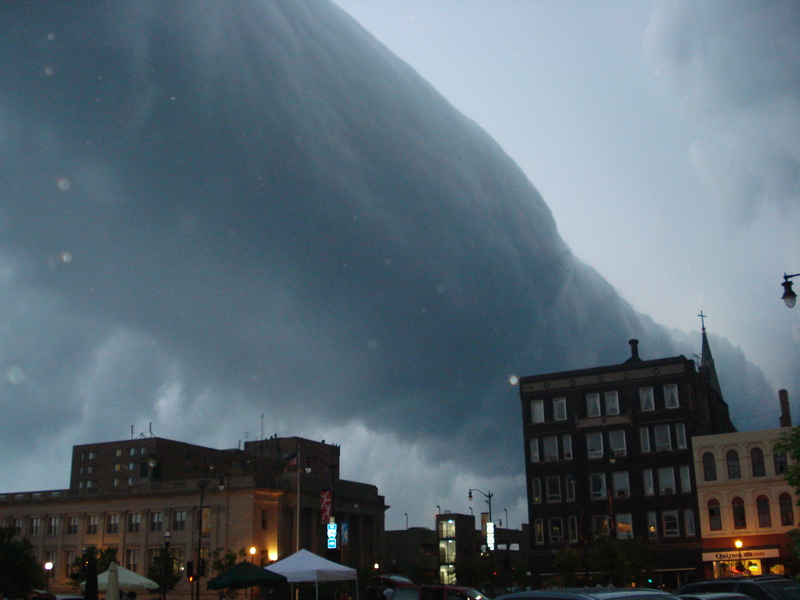 Roll clouds are often mistaken for tornadoes, especially when they hang low like this one did over downtown Racine, Wisconsin, in June 2007. But despite a superficial resemblance, roll clouds and funnel clouds don't have much in common. For starters, roll clouds are generally harmless. While a tornado's vertical vortex can wreak havoc on the ground — destroying entire cities in extreme cases — roll clouds tumble along slowly and horizontally. They also form at the front of thunderstorms instead of the back, where most twisters are born, and they aren't even attached to the storms that spawned them. The long, sideways shape is usually enough to identify a roll cloud, but if you still aren't sure which one is looming above you, it might be wise to just assume it's a tornado and take cover. Roll clouds can occur almost anywhere, but they rarely do. They seem to have a fondness for Australia's Gulf of Carpentaria, however, reportedly the only place on Earth where their arrivals can be reliably predicted. Known as "kangólgi" to Aboriginal people and "morning glory" clouds to local anglophiles, they most often form in the morning, especially from September to November. Their exact origins are hazy, though, since they aren't associated with thunderstorms like many other roll clouds are. 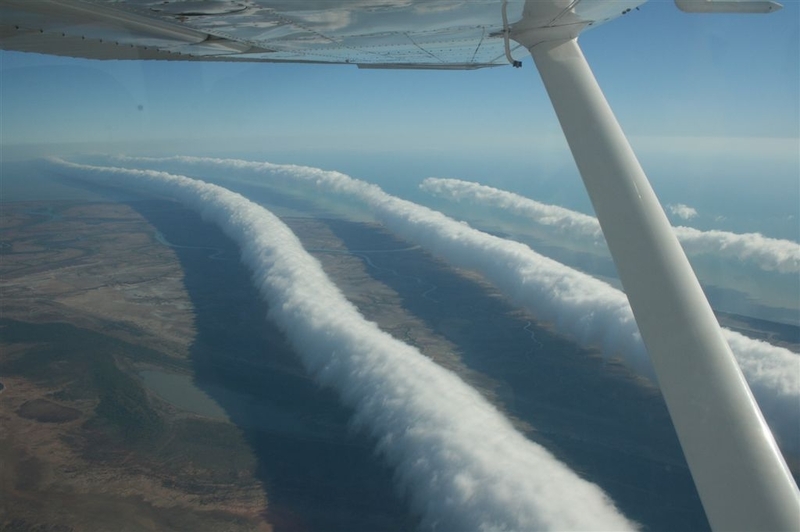 Morning glory clouds regularly attract glider pilots to the gulf — including Mick Petroff, who shot the photo above in 2009 near Burketown, Queensland. Art consultant Amy King was at Chicago's North Avenue Beach on Aug. 30, 2016, when a roll cloud appeared in the sky. She caught it in the time-lapse video above, which shows the giant tube coasting along the coast of Lake Michigan. The time-lapse effect accentuates the rolling motion, which is caused by winds changing speed or direction where warm air is stacked on top of cold air. This video isn't time-lapse, so the rolling motion isn't quite as obvious, but it still shows a remarkably tight, well-defined roll cloud. It appeared over North Texas in November 2013, where it was recorded by a couple just outside Amarillo. Todd Mask, who posted the video on YouTube, wrote that it "looked like an ocean wave rolling in," with a "horizontal vortex that extended horizon to horizon." Just because a roll cloud isn't linked to a storm doesn't mean it should be ignored. This one drifted over southwestern Ohio in 2006, for example, 5 to 10 miles ahead of a severe storm system that was blowing in from Indiana. The spooky scene gave residents an early warning. The National Weather Service notes that when an arcus cloud outruns its thunderstorm like this, it may be "a sign the storm is losing its potential to produce severe damaging winds." Still, that's not always the case, and it's often a good idea to take such foreboding skies seriously. On June 18, 2013, photographer Gry Elise Nyland got her day rolling by filming this enormous roll cloud as it drifted over Calgary. Letting the scene speak for itself, she offered only a one-word description of the experience on YouTube: "Wow!" 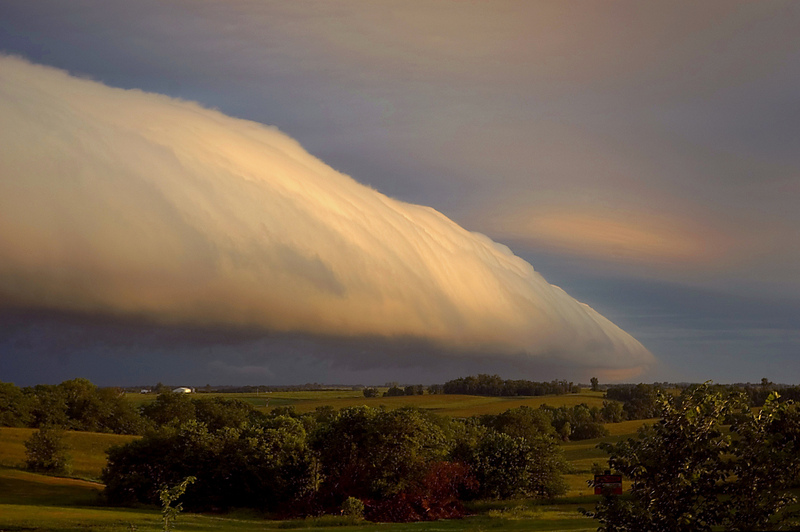 As if this roll cloud didn't look dramatic enough on its own, its front edge was also illuminated by the morning sun, which was just beginning to rise over northern Missouri on June 10, 2005. Photographer Dan Bush snapped this photo from a moving truck as he chased the cloud, which he estimated to be moving from west to east at about 35 or 40 mph. See more images here. If they're big enough, some storms look even more impressive from above. This long, meandering roll cloud was photographed over the Pacific Ocean on Oct. 5, 1985, from about 300 miles overhead. An astronaut aboard the space shuttle Atlantis captured the scene during the shuttle's first-ever mission, officially dubbed STS-51-J. This sinister-looking roll cloud found a willing audience as it passed over the National Weather Service offices in Lubbock, Texas, on the morning of Sept. 25, 2007. It was one of several bands of roll clouds that moved through the Lubbock area between 6 and 8 a.m. that day, as a cold front pushed south across West Texas. This messy roll cloud may be less organized than some of its relatives, but thanks to the lightning bolt behind it — and the quick shutter finger of photographer Joe Thomissen — it's still an impressive scene. Thomissen snapped this photo as a storm system moved over southeastern Belgium in June 2011. It's a rare shot, but lightning struck twice for Thomissen, who also took the photo below just a couple months later. Clearly he was on a roll. Editor's note: This article has been updated since it was first published in August 2011.